The Showy Lady’s Slipper Orchid is a rare plant indeed. The USDA has classified it as endangered in seven of the fourteen states for which data are available. It is listed as threatened in four other states, as vulnerable in one and as of special concern in another. New York considers this species to be exploitably vulnerable, meaning it is likely to be harvested for commercial and personal purposes. Specimens are often found alone, or in widely scattered groups of two or three. This place was unlike any either of us had ever seen. We walked among hundreds, forming a carpet along the ground. 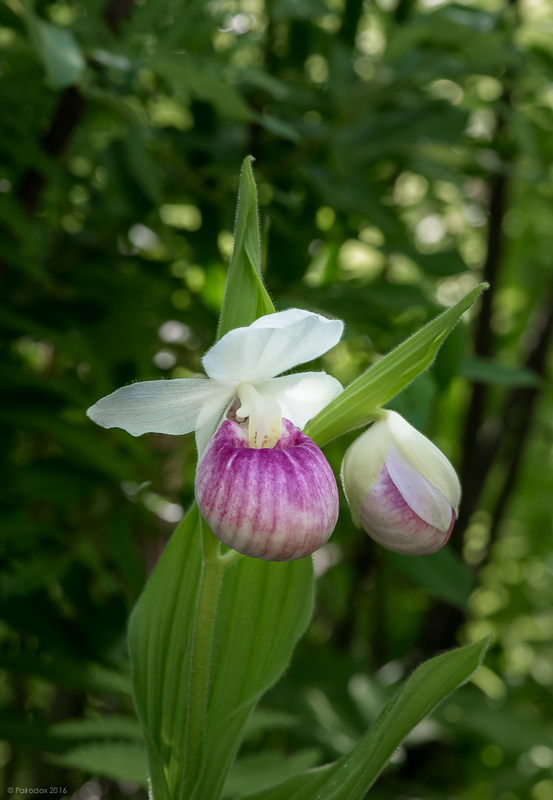 The traditional photographic view presents Cypripedium from the front or the side. I wondered, as I sat, how to show it to you in a slightly different way. Without the distraction of the large labellum, this rear view emphasizes texture and symmetry. I like it very well.